This month, I decided to join in the fun of the Spiked! 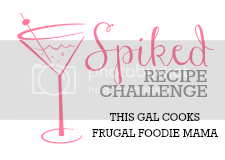 Spiced Rum Challenge hosted by Julie from This Gal Cooks and Carrie from Frugal Foodie Mama. I’m always a fan of cooking with booze (even though I’m pregnant because the booze cooks out & it’s preggy safe!) and this one really inspired me. 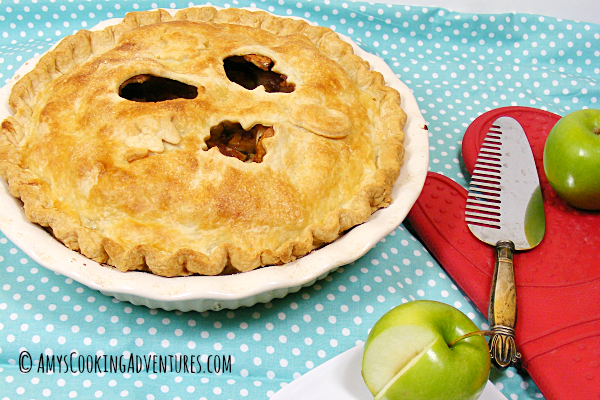 With Thanksgiving just around the corner, I knew I wanted to spike an apple pie! 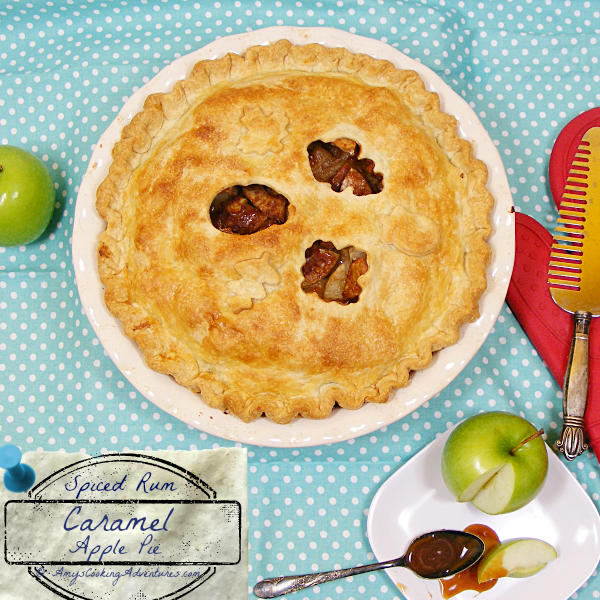 But not just any apple pie, a caramel apple pie! Thankfully, my candy making skills have come along way in the last year and after…ahem…two…attempts, I was able to whip up a fantastic Spiced Rum Vanilla Bean Caramel Sauce! 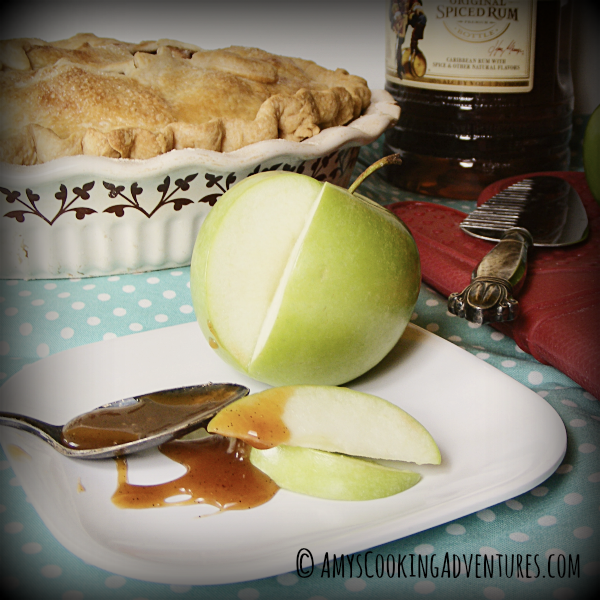 There isn’t a ton of rum in the sauce, but it is enough to add a beautiful robust richness to the caramel, which of course makes one of the best, flavorful apple pies I’ve ever eaten! Begin by making the caramel sauce. To make the caramel sauce, place the sugar and water into a small saucepan. Gently swirl to mix. Place the pan over medium heat. The sugar will dissolve and the mixture will begin to boil. Once the sugar mixture boils, place a candy thermometer into pot and continue boiling until the mixture reaches 350 degrees F. DO NOT STIR! Depending on your stovetop, you may need to increase or decrease the temperature slightly, but do not increase too much or the sugar will scorch. Once the mixture reaches 350 degrees, quickly move the pan off the heat and remove the thermometer. Immediately pour in the cream, rum, and vanilla bean. The mixture will bubble and spit furiously. Step back without stirring until the mixture calms down. Then, return the pan to the burner over very low heat. Cook the caramel, stirring constantly and scraping the bottom and sides of the bowl until any solids have dissolved, about 5 minutes. Set the caramel aside to cool to room temperature. Meanwhile, make the crust. To make the crust, whisk together the flour and salt in a medium sized bowl. Beginning with 4 tablespoons of water, sprinkle the water over the flour and butter mixture and lightly mix until it forms a ball. Add additional water as necessary. Split the dough into two equal pieces. Set one aside and cover with a damp kitchen towel. Lightly flour a surface and roll the dough into a 12-inch round (this should fit a 9-inch pan). Gently fold the dough in half twice (into quarters) and place in the pie plate. Gently unfold the crust and press onto the sides of the pan. Remove any dough that hangs over the edges of the pie plate. Next, roll out the other half of the dough into a large circle. 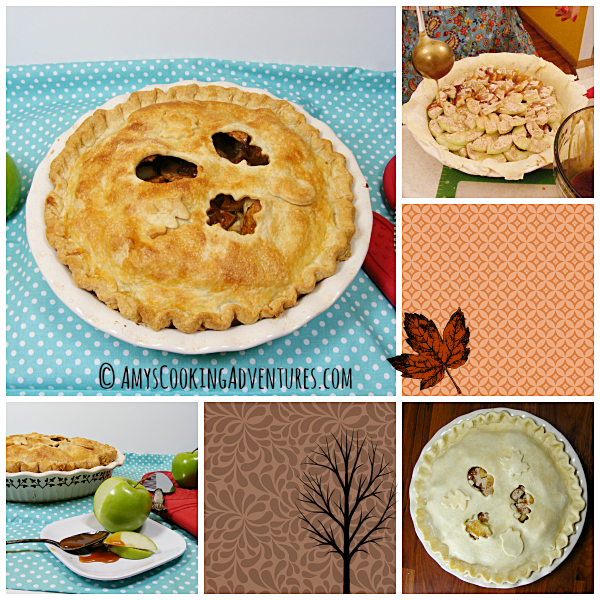 Use cookie cutters to cut leaf shapes, if desired, then place on top of the pie. Remove any excess dough. Fold over the crust and pinch edges tightly. Crimp the edge with your fingers, if desired. Use a new paintbrush to brush milk onto the backs of the leaf cutouts and place them on the pie. Once the leaves are placed, carefully brush the entire surface of the pie with milk and sprinkle with plain sugar. Place the pie into the preheated oven and bake for 10 minutes. Then reduce the heat to 350 degrees F and continue baking for another 40-50 minutes or until the crust is browned and the filling is cooked and bubbly. Remove the pie from the oven and cool on a wire rack. Cool completely before slicing and enjoying. This is a beautiful pie, Amy! I love the caramel, apple & rum combo! Thanks so much for participating in Spiked! Thank you so much for joining us in this month's Spiked! Recipe Challenge- Good luck! I'd say you spiked this one just right! 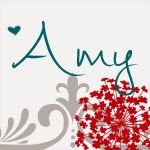 Sounds delicious, Amy. I really enjoy baked goods with rum and this pie with ice cream sounds amazing. Pinning!